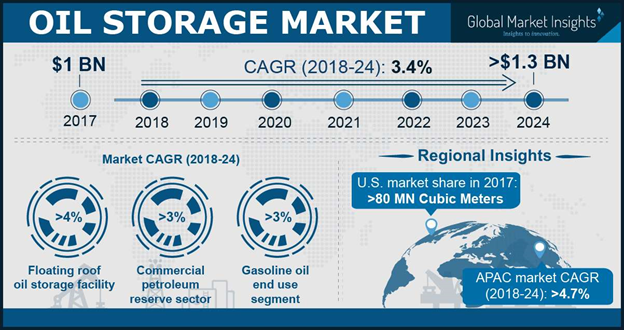 Oil Storage Market size will surpass 1.2 billion cubic meters by 2024, as reported in the latest study by Global Market Insights, Inc. Volatile crude oil prices along with increasing O&G production from geopolitically unstable countries including Iran, Libya and Nigeria will stimulate the market size. For instance, Iran’s crude production in 2018 has risen by 1 % from 2017 and is approaching a nine-year high. The continued mismatch between supply and demand resulting in a global hydrocarbon surplus will further favor the business scenario. Increasing investments toward the development of additional storage capacity from refineries to cater the increased demand for high value-added products will propel the market. For instance, in 2017, Klaipeda terminal announced to invest USD 42.9 million to construct six refined oil storages with a capacity of 20,000 cubic meters. Positive outlook toward refurbishment and construction of refinery units will further propel industry growth. The U.S. market size is anticipated to witness an appreciable growth on account of abundant O&G reserves along with ongoing development of unconventional hydrocarbon resources. According to the Energy Information Administration (EIA), production from unconventional oilfields accounted for over 50% of the total U.S. crude output in 2017. Aviation fuel in 2017, accounted for over 10% of the overall market. Introduction of several regional connectivity schemes along with growing demand for aviation fuels will propel the industry landscape. According to International Energy Agency (IEA), over 3.5 billion passengers travel annually by commercial planes worldwide. Rapid economic growth coupled with expanding middle-class base, primarily across Asia Pacific will further complement the business outlook. Abundant natural resources along with growing initiatives toward the exploration and development of undeveloped reserves will fuel the Indonesia market. In 2017, Indonesia held proven reserves of over 150 tcf of natural gas and 7 billion barrels of oil. Introduction of production sharing contracts and tax schemes to support petroleum investments will further strengthen the industry growth. Growing concerns over maintaining hydrocarbon inventory stock and protecting country’s economy in an energy crisis will stimulate the strategic petroleum reserve oil storage market. In July 2017, Vietnam announced to invest USD 6 billion to construct strategic petroleum reserves by 2020. Floating roof tank oil storage market is predicted to grow over 3% by 2024. Ability to offer minimized petroleum product losses and lower Volatile Organic Compounds (VOC) emissions will strengthen the product adoption. These tanks are suitable to store medium and low flash point products including aviation fuel, crude, and other middle distillates. Europe oil storage market is anticipated to witness growth over 2% by 2024. Growing petroleum trade movement along with increasing merger and acquisition activities among the major companies will augment the industry landscape. In February 2017, Crédit Agricole Assurances acquired 40.1% share of MSSFH, a subsidiary of Pisto to expand its market share in France. Industry participants across the oil storage market include ZCL Composites, Superior Tank, Synalloy (Palmer), Waterford Tank & Fabrication, Synder, L.F. Manufacturing, Tianjin Anson International Company (TICO), Roth, Hydrotherm Engineering Services, Denali, Vopak, CST Industries, Ergil, Elixir and Sri Ranga Industries.